VE Day celebrations in the Strand, London, WWII, 8 May 1945. 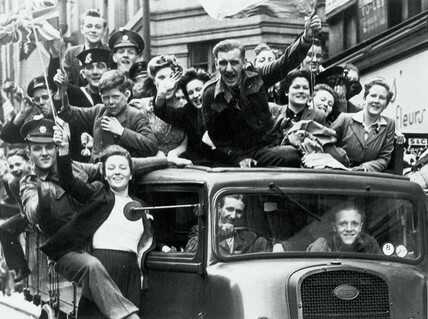 A smiling crowd celebrates Victory in Europe. 'Shrewsbury School', LMS poster, 1938. 'All the Better for A Day at the Sea', BR poster, 1948-1965. 'Football Asociation Cup Final', LNWR notice, 1922. 'All clear for the guns', BR poster, 1940s. 'The Continent via Harwich', LNER poster, 1933. 'For Over 100 Years in Peace and War,' LMS poster, 1939-1945. 'God Save the Queen', BR poster, 1953. 'Repton School', LMS poster, 1938.